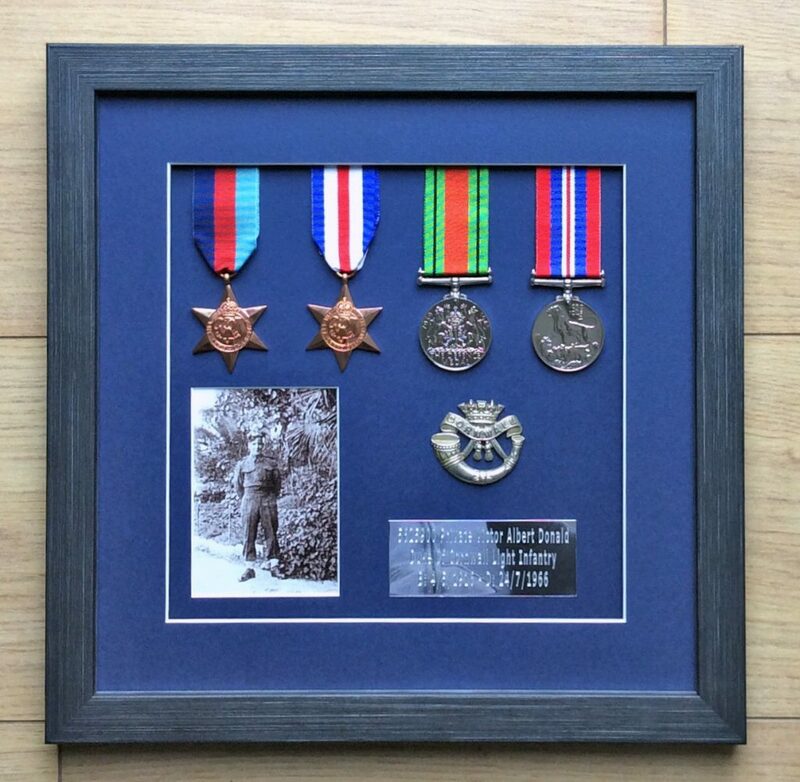 I received an enquiry from Debbie Summers of Acorn Framing in Bognor Regis asking if I could restore a very poor computer print photograph of a soldier she has been asked to frame with the soldier’s medals as a tribute for their family history. Debbie then suggested that her customer added a nameplate with the details and also a genuine cap badge to go into the frame too. This was agreed and Debbie supplied these. With Christmas now on the horizon here are some ideas for a unique gift that’s ideal for those who can be tricky to find something a bit different. Here just a few examples of the many ways I can transform your photographs…. If you have a photograph that has faded in its frame, it can be restored and re-coloured. Family groups can be ‘adjusted’ to include or exclude people! Couples can finally be together in the same photograph. Treasured photographs that have suffered years of damage can be restored to their original state. Combine a favourite photograph with a more interesting background. Not sure which photos to use but can see the potential? A Photographs Forever Gift Voucher of any value could be the answer. For example I restored a drawing that, over the years had become torn, dog eared and generally in very poor condition. I restored the artwork and made an enlargement on archive paper and mounted this in a plain black wooden frame. Do you have precious unique documents such as Birth Certificates, School Reports, Qualification Certificates, Death Certificates, Wills or any other documents that should be digitally preserved and restored shared with other members of the family? If you are creating your family album or your family tree, you could add images of important documents. Do you have negatives of possibly precious photographs and lost the prints? Do you have a collection of negatives and you’ve no idea what the images on them are of? I can scan your negatives whether they are 35mm or 127, 126, 120 roll film or even the really old glass negatives and provide you with positive images as data files, which I can then restore if necessary or just print or enlarge your favourites. You may have a large number of 35mm or 6cm slides from the 70’s and 80’s but no longer have a projector that works. Let me scan and improve them so you can enjoy them again. They are often really high quality and make great enlargements. So don’t delay, wherever you are, whatever town, city or county, look out those precious documents, drawings, artwork, negatives, slides and of course those fantastic old family photographs and let me restore them, repair them, retouch them so you and your family and friends can enjoy them forever. This is a great opportunity to get a quantity of your favourite photographs scanned and optimised for just 99p each. The normal cost of this service is £3.50 each or £2.50 each if there are more than ten photographs. WHY YOU SHOULD I GET MY PHOTOS SCANNED AND OPTIMISED? No longer the only photos in existence! “I’ve just received the photographs, they are perfect thank you very much indeed, you are a gentleman. This is a great way to save money on your photograph restoration so get in touch now! Rush Job From Mexico Completed In 9 Hours! So in recent months I have carried out restoration work for customers in Canada, Spain, Australia, South Africa, Isle of Man, Germany, USA, Italy and now Mexico! I recently was asked by Simon, accordianist with the folk/dance band Bof! to manipulate graffiti he had photographed to produce CD cover artwork for their forthcoming CD. “I play traditional French and Breton dance music in a band called Bof! We have been going since 2000 and in that time have made three CDs. Earlierthis year we decided to make a fourth recording and, having recorded the music, we looked around for a suitable CD cover image. We looked at dozens of photos – some of idyllic scenes of the French countryside and others of people dancing. But then we came across a photograph I had taken while on a holiday in France some years ago. It was a picture of graffiti on a wall in the ancient, picturesque city of Quimper in western Brittany. The image expressed strong traditional Breton themes using the medium of spray painting favoured by graffiti artists the world over. The music Bof! plays is traditional but with a modern flavour, so this image seemed perfect for us. Somehow, however, we needed to superimpose text on the image. How could we do this without spoiling the artist’s work? We came up with the idea of manipulating the image to include the name of the band, Bof! and the title of the recording, Bal (the French for dance). So I sent my image to Photographs Forever to see if they could do what seemed like an impossible job. I have to admit I wasn’t very optimistic, but you can see the results for yourself. Needless to say we are delighted with how it’s turned out and this image will be the cover of our new CD which we hope to release in June. If you’re a regular user of Genes Reunited, you may already have investigated our Keepsafe feature, which allows you to upload treasured family photographs and documents. It’s a great way to ensure your digital legacy – a carefully curated and preserved archive that you can share with your family. But what about all those old photos that you keep meaning to scan in, but just haven’t had the chance? Photos, like any archive material, can degrade over the years – have you checked on those shoeboxes and old albums recently? 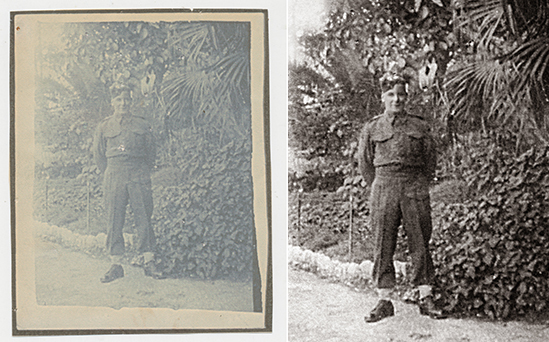 Richard Haines of Photographs Forever specialises in restoring old photographs, and says “Unfortunately photographs don’t age well and over time their quality deteriorates. Because photos are printed on paper, things such as handling, light, moisture, dust, and scratches often affect them. Regrettably, these factors can ruin our photos and prevent them from lasting through future generations. Poor storage, such as keeping photos in attics or basements or allowing photos to be exposed to sunlight, have all contributed to the poor condition of most of our photo collections. Once you can see the detail in those old photos more clearly, they may even hold valuable clues to aspects of your family history – who’s that woman standing on the edge of the family group? What’s that landmark in the background? Richard says “Deteriorating photos may provide important historical links in your family or possible clues about your ancestors. When rebuilding your family tree, it is possible to determine certain aspects of your ancestry, such as weddings, landmarks of geographical nature and important occasions. Enhancing your old photos may reveal details you had not noticed before.” Remember, when you upload your photos to Keepsafe, you can choose to make them public to other Genes Reunited users and invite others to help you investigate them further – someone else might have the answers you’ve been looking for. Take some time this week to look over your old photographs and create safe digital copies of them – you may even find precious photos you’d like to see restored. And if you have any questions regarding preserving old photographs then Richard would be happy to help you. People that have had their special photographs restored will have realised the value of having had this work done. As well as restoring damaged and faded black and white photographs there are other types of restoration I thought you may be interested to know that I do. Then there’s the terrific artwork that our children have done at school on awful quality paper that fades and tears so easily. Photographs that contain unwanted articles, backgrounds or even people! So do make the time to dig out those important photographs, paintings or newspaper articles etc and get in touch with me so I can restore them to their former glory or, in many cases, give you results better than the original ever was!